My recent press trip to Malaysia was jam-packed to say the least. We sailed to deserted beaches, chugged through mangroves, braved the world’s steepest cable car, came face to face with monkeys and more. All of this was done in just 3 full days, so it’s safe to say me and me fellow bloggers were rather exhausted and very sad when the trip came to an end. 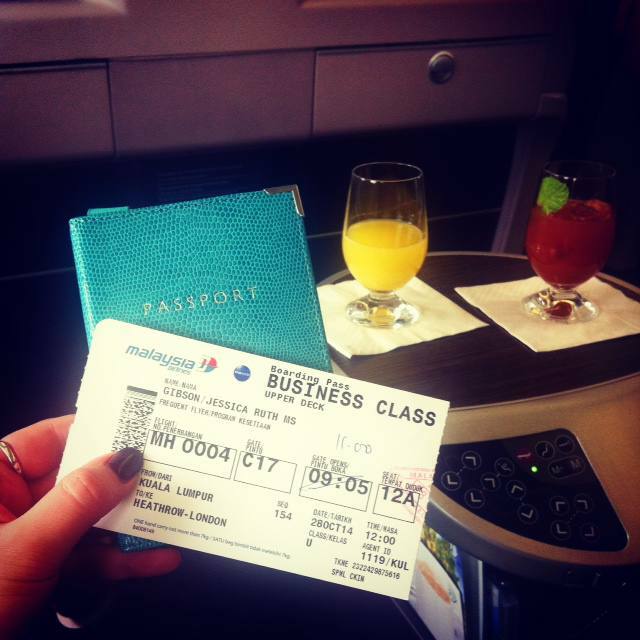 But the silver lining on our itinerary was experiencing Malaysia Airlines Business Class back to London. Having flown Economy with Malaysia Airlines on the way out, we were all very excited to upgrade into luxury for our final leg of the journey home. Our Business Class experience started when we arrived at Kuala Lumpur airport and checked into the Golden Lounge, Malaysia Airline’s exclusive airport lounge for Business and First Class passengers. The lounge in Kuala Lumpur is absolutely huge and has endless seating and spaces to relax. There is even a spa attached to the lounge offering pre-flight massages and treatments at very reasonable prices. The food and beverage offerings within the lounge are expansive and complimentary. Despite the 8am arrival, I tucked into a plate of delicious Malaysian chicken curry (my body clock had never been so confused). After a little delay, our flight was ready to go and as Malaysia Airlines Business Class passengers, we were given priority boarding. As I stepped into the Business Class area, I was amazed at how much more spacious the cabin felt. There were 6 seats to a row with 2 aisles splitting the seat evenly. The ceilings felt much higher too. A few minutes after we were shown to our seats, we were offered an ice-cool glass of champagne, orange or tropical juice drink. I went for an orange juice, which was heavenly in the still-warm cabin. The catering in Malaysia Airlines Business Class was head and shoulders above anything we received in Economy. The food was served with a white tablecloth, polished cutlery, white crockery and real glassware. 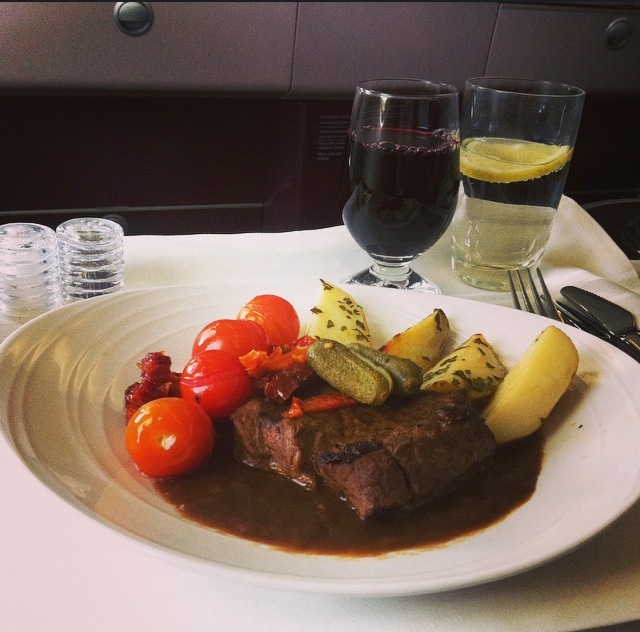 It was a real dining experience and nothing like the plane food you would imagine. Not long into the flight we were offered an appetizer of chicken and beef satay skewers, an award-winning dish for Malaysia Airlines. The skewers were served with peanut satay sauce and tasted lovely. I thought it was a really nice touch that they had famous Malaysian dish as their signature appetizer. During the flight we also got to experience the ‘Chef on Call’ menu, which is available to all Business and First Class passengers. The ‘Chef on Call’ menu has a huge selection of international dishes, which are available to pre-order before your flight. There was so much choice on the menu it took me a while to decide, but I went for slow-cooked beef cheek with vegetables. The airhostess knew my name and order exactly and placed the hot dish on my table, which was a nice personal touch to the Malaysia Airlines Business Class experience. I chose to have slow-cooked beef and veggies accompanied with a glass of French red wine for my ‘Chef on Call’ experience. Whilst the food and service were impressive, the best bit about my Malaysia Airlines Business Class experience was the reclining seat. 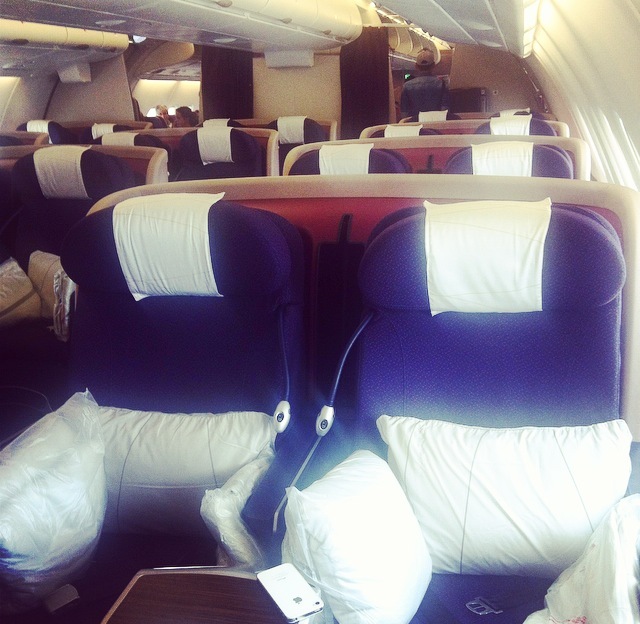 The seat could be adjusted into a completely flat bed, which I thought was absolutely amazing for Business Class. I have been lucky enough to fly First Class a couple of times before with seats that turned into beds, but I have never known any other Business Class to offer a fully horizontal bed. I think this is something quite unique and something that definitely provides great value for money over other Business Class seats. Along with my pillow, blanket and eye mask, I managed to drift off into a peaceful sleep for the majority of the flight home, which was absolutely amazing! Looking a little disheveled but feeling very refreshed at the end of our 13 hour flight! My Malaysia Airlines Business Class experience was very impressive and certainly on par with the other first class experiences I have had in terms of service, comfort of the seat/bed and spaciousness of the cabin. 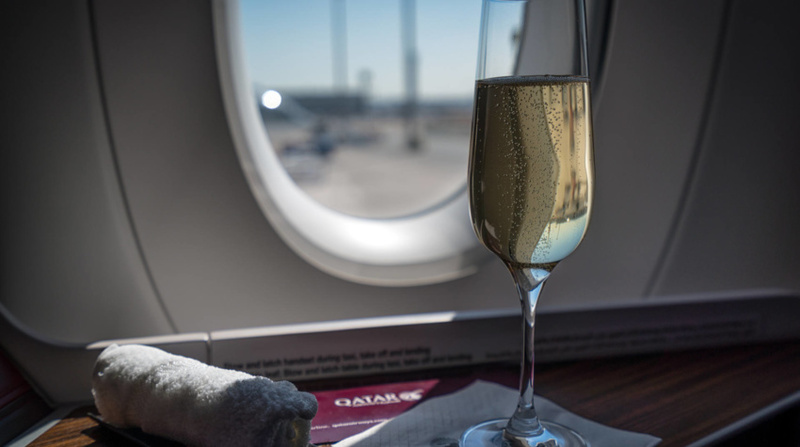 There’s no denying that travelling Business Class is substantially more expensive than Economy. However, if you looking for a bit of extra luxury or fancy splashing out for a special occasion, upgrading yourself is a no brainer. Want to read more of my airline reviews? Check out Flying First Class with Virgin Atlantic and My First Time in First Class with Air Mauritius. Or find out exactly what I got up to in Malaysia. I’m pretty jealous – that food looks amazing! 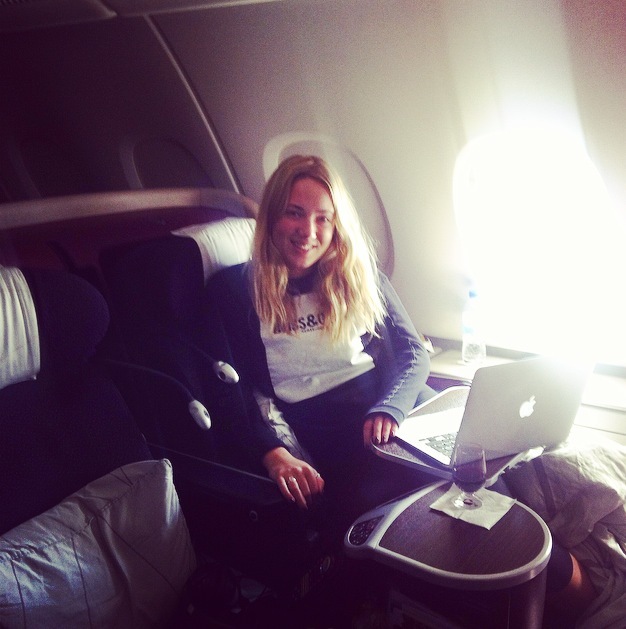 I’ve only ever flown first class once and it was quite frankly the best journey i’ve ever had! 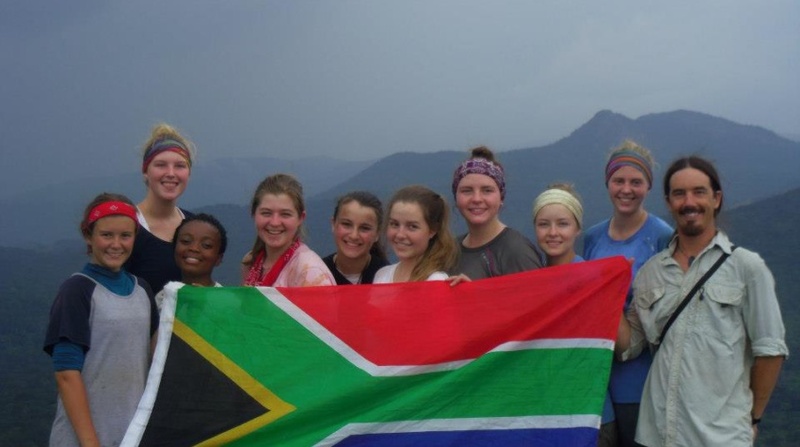 Thanks for sharing and best wishes for 2015! Jess you don’t look disheveled – you look far too glamorous for the end of a 13 hour flight!! Now I have to ask Jess, as they were 2 x 2 seats – if your business class neighbour had their seat fully reclined into a flat bed would you have had to climb over them or was there enough space to walk around the flat bed? On our flight back from Cairo we had the 2 x 2 configuration on our BA flight and it caused all kinds of problems as drinks were getting spilled when business class passengers were trying to climb over each other and there wasn’t any privacy. There were a lot of complaints on our flight with the seat configuration however the seats were more comfy than the plane we flew out on – you win some your lose some!